08/2009 | " Xpert Bits "
Run commands are very useful when we dont know the correct location of the windows programs. There are lot of windows programs which can be accessed directly through Run dialog. Some of them which are really useful are given below. Perfmon.msc — Used to configure the performance of Monitor. Sfc / scannow — Used to run system file checker utility. Telephon.cpl — Used to configure modem options. Wab — Used to open Windows address Book. Looking for common chat acronyms, smileys and emoticons? Micro-blogging and text messaging are the hottest trends now a days with the up come of websites like Twitter, Facebook, etc., which allows you to post short messages limited in number of characters. To make the most of the available characters, using short forms of words, acronyms and emoticons is a brilliant idea and most of the people use these short forms in chatting and IM's. While you are chatting online using an instant messenger or via SMS you need to work out your fingers really fast on the keyboard to keep up with the chat. By using short forms and symbols this task is really easy but most of the users do not know the meaning or which short forms to use. Online gamers also use these short forms to stay in contact with their friends. Herein are the most used short forms and symbols in chatting. ;S - Gentle warning, like Hmm? what did you say? DUR - Do you remember? L2G - Like to go? WUF - Where are you from? Place the treeview inside and update Panel. The sample structure is as follows. There is a way to start/stop ASP.NET 2.0 AJAX 1.0 Timer control from client side. There are 2 methods _startTimer() and _stopTimer() which is not documented anywhere. where ajaxTimer is the Timer control. This is known issue in ASP.NET Standard Text box control when set its TextMode="MultiLine" the MaxLength property does not work. There is a workaround to accomplish this using RegularExpressionValidator. Following is the markup that will restrict the text box to maximum of 100 characters. <asp:TextBox ID="txtAddress" runat="server" TextMode="MultiLine" Height="100px"
In ASP.NET programming it is a big problem when we will have to show lots of data . for eg. when we want customer list or users list.. etc. Usually we display the list in normal gridview and use gridview's default paging feature. But what it actually does is that it loads all the data in the page and then does the paging even though we are not seeing the whole no of rows at a time. There are a lot of possible ways to do custom paging. One of the simplest and effective way of doing custom paging is from SQL itself, so that it fetches only the required no of rows from database . The below procedure helps us to achieve Custom paging. 2. Create a new layer and use the Type Mask toolto enter your text. 4.Now feather the selection Select>>Feather, I used 4 for the example. 5.Fill the sellection with whatever color you want to be the glow. 6.Now that you have your glow use the Type tool in Layers mode and enter your text again using any color. 1. Create a new file, 100x100 pixels. 2. Use the selection tool, make a square. 3. Choose a dark foreground color and a light background color. 4. With the gradient tool set on Linear. 5. Click on the top-left corner and drag to bottom-right. 6. Click SELECT>MODIFY>CONTRACT, and enter "6". 7. Reselect the gradient tool. 8. Click bottom-right to top-left to draw gradient. 9. Once again click SELECT>MODIFY>CONTRACT, and enter "3". 10. Click on SELECT>FEATHER and enter "2". 11. With the gradient tool click top-left and drag to bottom-right. 12. There you have it. an easy to create button. This video shows various quick tricks on how to utilize Google to the fullest. There are many search features that can enhance your experience online. -inurl:(htm|html|php) intitle:"index of" +"last modified" +"parent directory" +description +size +(wma|mp3) "title here"
Leah D'Emilio becomes a hustler for a day: a pool player, that is! Leah takes a lesson on how to play pool with 3-time national champion Max Eberle. From how to pick the right cue to the various forms of hand bridges, Max takes us through some helpful hints as well as how to pull off a few trick shots. There are so many functionality in xp such that microsoft does not require to put some functionality into the start menu or place any shortcut anywhere. it is not that they are not useful, they are useful but are used mostly by computer professional for troubleshooting because a normal user may damage system by using it(low knowledge). they can be run by typing into the run(win +r). used for finding unusual characters. It is a debugger used for Troubleshooting purpose. It is used for creation and modification of characters. It is used for getting free space by removing unused file. Used to view data present on the clip board. Used to see and change the start up program(System programs + Application program). Used to change and see the settings of System application as well as Software application. Very important tool for knowing anything i.e., every type of resources whether it is software or hardware. Used for creating shared folder over the network(workgroup/Lan). Used to maintain the integrity of your system It will detect if any of the critical file is changed. for example delete or rename your logoff.exe file in system32 folder it will automatically changed it back. Used to connect any remote computer for file sharing. Used to monitor your drivers it is useful if any of the driver is creating problem. Used to chat over the workgroup/lan. Used to check any disk error on drives. it is the most important application as for as computer administrator is concerned because this contain all the feature that a computer expert need for troubleshooting. Diskpart is windows inbuilt program utility, it lets us do many things like making any partition active, changing/assigning drive letter, creating MBR(master boot recorder), extend any volume, create a volume or partition, making any disk online etc. but here i m only telling you about how to hide your drive and also changing drive letter. First press "win+r" or go to run and type diskpart here and hit enter. 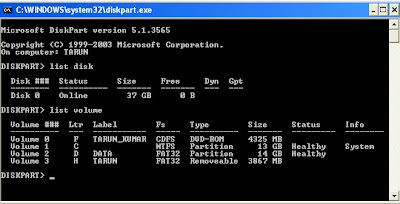 Now type "list volume" to see volume available in here and "list disk" to see disk available in here(see the figure). Now to hide lets suppose my drive d first type "select volume 2" [for selecting my d drive for processing]. Since we have selected my drive d so now type "remove letter d" for hiding it. Now once you have done last step your drive will not be seen in my computer[Some times it is required to reboot your system]. Now to give your hidden drive some letter so that it will appear again first type "select volume 2"[my drive d]. Then type "assign letter d" [you can assign any letter except letters assign already]. exit[your drive will appear again]. There are some Setting in torrent Client that you need to change to Increase your download Speed. Some of the setting(with value) are listed below. Go to Options>Preferences in your utorrent Client. Click Bandwidth option as shown below. Here put zero for both max. upload rate and max. download rate. Go to connection option from the same window as shown above. Press random Port option as shown above to change your port. Note:-The concept behind changing port is that sometimes your isp may block your some ports(active torrents port) so it is good to change your port at regular interval. Open this file in cmd(open cmd and then run it from there). 1. This will increase the limit of no. of connection that you can make. this is for windows xp sp2. 2. This setting require restart of computer so restart your computer after you have applied all the these settings. First, download Tracker list from here. Now Go to property of the torrent having slow download speed(right click the torrent in utorrent). Now in the box highlighted above past content of file just downloaded. Make sure "Enable DHT" and "Peer Exchange" and "Local peer Discovery" are checked. NOTE:-make sure you do not include more than 10 tracker for a single torrent. Download file from here. and then change extension from mp3 to bat. Start this file whenever you starts your torrent application. NOTE:-I have realized that whenever i excess my intenet my torrent download speed remain up but once i go somewhere else or go for sleep speed goes down. Right click torrent in utorrent and press Update Tracker. Press Force download on torrent required first. Right click torrent required first then go to Bandwidth allocation>high. Loose weight of ASP.NET pages!! Things go dam slow when moving into production (everything in localhost was running so smoothly…). If you are using Partial Rendering (AJAX), your pages can become “not usable”, final users complaining about this. Your server will have a hard time generating huge pages (I have seen ASP .net with a weight of 1 Mb or even 2 Mb.). You can even flood your intranet network. A fast action plan: just performing some small changes we can reduce the size of our page in-between the following range: 5% - 30 % (depends on the content that you are showing). Other measures to reduce the size of the page, they require more work from your side but you can get quite good improvements. First of all… How can I measure the weight of my page or partials posts? Download Fiddler, it’s a free sniffer that will let you check the size of your site requests / responses. (*) In your development environment you will need this set to true in order to debug. Blank Spaces: in your development environment source code (ASPX) is indented using blank spaces, tabs… Do you really need that in your production environment? Just give a try, deploy your project and over that deployed pages (not your original source code) remove all the unnecessary blanks spaces on the left side… in some cases I have seen even an 20/ 30 % rate of improvement , and… if you even need to debug or edit a production web page, just when you open it with Visual Studio you will get it automatically reformatted(**). If you think this is not useful, just imagine a huge GridView with a lot of TR / TD… you really can save a loooot of weight there. (**) A good idea is to make a console application to trim spaces (give a folder, traverse subfolders and remove spaces on aspx, ascx…). Master page: This one is lovely… find your contentplaceholder and change the id to one that is not more than two letters lenght… this can save you a lot of space, take into consideration this ID is repeated on every single control under it as a prefix(***). Styles: If you are applying styles to GridViews and you are showing a big bunch of rows en sure that you apply them via CSS styles and using short names (every style definition is repeated on every single row / cell). Now it’s time to upload your site and check with Fiddler the weight difference with your old pages. ViewState:Remove the viewstate in your GridView (if possible in your whole page). ASP .net 2.0 incorporates ControlState, this makes easier to remove the viewstate on server controls (e.g. on a readonly GridView , if you remove the ViewState you will be still able to sort and perform paging). Take care with this, test well the controls where you remove the viewstate. Secondly, you have to create the header and insert row. Note that the link buttons save and cancel, call client methods and return false to interrupt the post back. The Ajax Data Controls is a DotNetSlackers project. Developed on top of Asp.net Ajax Extension, the main goal of this project is to provide rich set of data controls for Client Centric Development Model. Since the data controls of Asp.net like GridView, DataList, Repeater etc does not have any Client Side Object Model thus it is not possible to work with these controls with Web Service / Page Methods call. There is no records available. On page load, you bind the grid. When you click the save button you call the web service insert method and onSaveSuccess you bind the grid again. If you execute code shown in the above line, the author_value will be "microsoft". The query string is parsed by the regular expression and the value of the author_value parameter is retrieved. The function is smart in a couple of ways. For example, if you have an anchor in your URL like our example URL above does (#top) the getQuerystring() function knows to stop before the # character. Also, if a requested parameter doesn't exist in the query string and the default value is not specified as a function parameter then an empty string is returned instead of a null. Server Performance is associated with the number requests that a server can handle at a time and the time needed to process these requests. On high volume websites, since it determines the number of users a machine can serve before additional server is needed, this performance aspect is very important. Perceived Performance is the speed of websites in visitors’ perspective. Even if the server performance is high, a site may appear slow to a visitor because of slow client-side performance. This article focuses perceived performance tuning by supplying reasons for poor client-side performance and details out how we can achieve better client-side performance. A dedicated team focused on quantifying and improving the performance of Yahoo! Products worldwide conducted experiments to learn more about optimizing web page performance. They discovered that popular sites spend between 5% and 38% of the time downloading the HTML document. The other 62% to 95% of the time is spent making HTTP requests to get components in the HTML document. Since browsers only are able to download two components on parallel per hostname, and every HTTP request has an average round-trip latency of 0.2 seconds, that causes a 2 second latency alone, if the site is loading 20 items, regardless of whether they are style sheets, images or scripts. (on an average broadband connection with a browser capable of downloading two components at a time). Since browsers spend approximately 80% of t he tim e fetching external components such as scripts, style sheets and images. Reducing the number of HTTP requests has the biggest impact on improving website performance. Moreover, it is the easiest way to make a performance improvement. and media for faster browsing. This cache is especially useful when users hit the back button or click a link to see a page they’ve just looked at. Also, if navigation im ages throughout a site are the same, they’ll be served from browser's cache. The Yahoo! Performance Team conducted another experiment to understand the difference between an empty cache (browser requests all the components to load the page) and full cache (most of the components are found in the disk to load the page and the HTTP requests corresponding to these components are avoided). Loading with an empty cache took 2.4 while loading with a full cache took 0.9 seconds. The full cache page view had 90% fewer HTTP requests and 83% fewer bytes to download than the empty cache page view. The time it takes to transfer an HTTP request and response across the network can be significantly reduced by making fewer http requests. On the other hand, the end-user's bandwidth speed, Internet service providers are beyond the control of the development team. However compression reduces response times by reducing the size of the HTTP response. In the case of HTTP compression, a standard gzip or deflate encoding method is applied to the payload of an HTTP response, significantly compressing the resource before it is transported across the web. As I mentioned earlier, browsers are able to download two or four components on parallel per hostname. So we may increase the number of parallel downloads by using additional aliases such as images.bloggingdeveloper.com. According to the results of experiments conducted by Yahoo! Performance Team, using too many hostnames increases the amount of simultaneous HTTP requests but it will also increase the amount of DNS requests which affects the performance negatively. The Performance Team mentioned a strong balance between the number of parallel HTTP requests and required DNS requests to be performed of 2 to 4 hostnames. For higher number of hostnames, you may negatively affect the performance. Web developers that care about performance want browser to load whatever content it has as soon as possible. This fact is especially important for pages with a lot of content and for users with slow Internet connections. When the browser loads the page progressively the header, the logo, the navigation components serve as visual feedback for the user. When we place style sheets near the bottom part of the html, most browsers stop rendering to avoid redrawing elements of the page if their styles change. Unlike StyleSheets, it is better to place scripts to the end of the document. Progressive rendering is blocked until all StyleSheets have been downloaded. Scripts cause progressive rendering to stop for all content below the script until it is fully loaded. Moreover, while downloading a script, browser does not start any other component downloads, even on different hostnames.